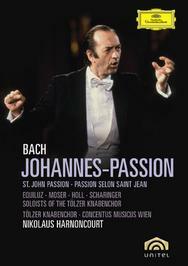 For the Bach anniversary year in 1985, Nikolaus Harnoncourt and the Concentus Musicus performed St. John’s Passion in the exquisite Graz cathedral. Harnoncourt – widely recognized as one of the world’s foremost interpreters of the music of Johann Sebastian Bach – conducts his period-instrument orchestra along with Kurt Equiluz, Robert Holl, and soloists of the Tölzer Knabenchor. Total Playing Time: 114 min.